Autumn weather (dry, cool and windy) tends to increase Vata dosha and make our skin feel equally dry, flaky and tight (think what happens to the leaves on the trees). If you work in an air conditioned office or cycle around, the effect is doubled! As well as a soothing, warm oil massage for the body as an Autumn treat, its a good idea to nourish our faces which are always exposed to the elements. Ayurvedic wisdom sees the skin as being a very receptive organ, so ideally don’t put anything on it you would not be happy to eat! I tried some face creams on my dressing table and got a nasty shock, so out went the Clarins! Try these delicious moisturising and nourishing Autumn face masks for a quick and easy boost this Autumn. 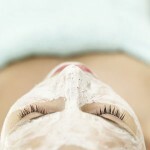 Apply to cleansed face and neck on a weekly basis. Relax and rub off with fingertips/ face cloth after 20 minutes in circular motion. These masks will keep in the fridge or 1-2 days, but best to use immediately. Remember- healthy skin comes from feeding the body and skin with high quality nutrients, and keeping toxin levels in the body as low as possible. Using organic ingredients helps ensure this. Avocado & Banana mask: Mash ¼ avocado, ½ banana, an egg yolk and enough clay or oatmeal to bind (green or white clay available from Neal’s Yard Remedies or on-line). Combine some of the following ingredients to make your own scrubs for Autumn, by grinding in a food processor, blender or pestle and mortar. The starches and enzymes in these cereals, pulses and nuts will be activated during treatment and work to cleanse the face. Mix, grind and store some of the following in a glass jar: Oatmeal/oats, ground almond, milk powder, a pinch turmeric, ginger, dried basil, cloves, orange peel, chamomile flowers (use a tea bag), a few dried rose petals…. Mix enough for one application with warm water when ready to use. Apply to damp skin, excluding eye area. Wipe off gently after a few minutes or rinse with warm water- so no scrubbing motion is actually needed. You can also use rose water, aloe vera juice, sesame oil or even cow’s cream for ultimate luxury! Follow the ubtan with your fresh mask. 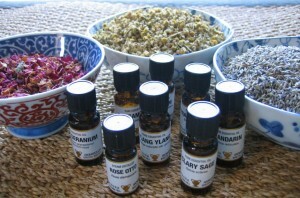 I really enjoy the beauty aspect of Ayurvedic living. The following books are all recommended or come on one of my workshops to find out more.